Bathroom & Bathtub Safety for the Elderly – Why Is It Important To Choose The Correct Grab Bars? While some handrails and grab bars are designed for simple all-purpose home use, the fact of the matter is that sometimes stronger, more reliable grab bars become a necessity for accessibility in showers, tubs, and many other relevant applications. In fact, the ADA has issued a list of certain specifications for grab bars that are intended to ensure they will meet or exceed the needs of those that require them. What Are The ADA Standards For Grab Bars? An ADA compliant grab bar must provide a 1.25 to 1.5 inch graspable surface. 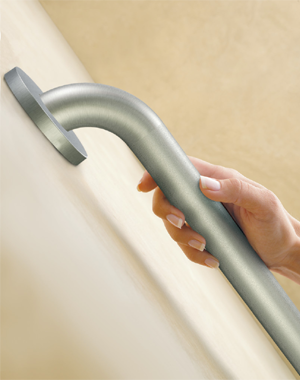 Grab bars should maintain a 1.5 inch gap between the wall surface and the grab bar surface. Compliant grab bars will be able to sustain 250 pounds of stress before bending or breaking. The fasteners used to secure an ADA compliant grab bar to the surface should also be able to maintain total stability at 250 pounds. Grab bars must be fixed – meaning they cannot rotate in any way. Any edges on a compliant grab bar fixture cannot be sharp; thus, the minimum radius of an edge or corner should be at least 1/8 of an inch or more. These standards are intended to be a guideline for safe and proper installation of grab bars. They also provide a basis for many building codes. They’re readily available to order online and at most home improvement stores. Straight-type grab bars are very easy to install. Most straight grab bars on the market will be certified to meet or exceed ADA standards. There are a variety of nice-looking colors and finishes to choose from with this type of grab bar – from stainless steel, to brass, to chrome, and beyond, there’s literally something to match the fixtures of just about every bathroom. Because straight-style grab bars are standardized and mass produced, they’re not usually very expensive. Really, the only downfall to a ready-to-install, off the shelf straight grab bar is that it might not be exactly the right size or shape desired. They can be created precisely to fit any angles or contours of the room they’ll be installed in. Custom grab bars can be designed to outperform standard premade bars when it comes to strength capacities and size features. Different grip textures are often available when choosing a custom made solution. Color and finish plating choices are practically unlimited to the imagination. Although they do take more time and effort to create and install, custom grab bars are ideal for a long-term solution. Do remember that it is important to ensure that even the customized solutions meet the minimum ADA guidelines. By keeping these grab bar basics in mind, you’ll be able to create a safe and attractive accessible environment.